The construction has started on my little house here in San Felipe. After many meetings and discussions about what to build and how much to spend I gave the go ahead and the job started yesterday. After two days we have brought in five or six loads of dirt, laid out the lines for the house, leveled the building site and dug the trenches for the footings and brought in equipment to mix the cement. I was a bit concerned that the house was not lined up with the road and after discussion with my neighbor who informed me all the lots on this road and possibly the whole Camp are irregular shaped I accepted the location of the house. After the house is built and a wall is built around it the angle of the house won’t matter much. I also got satellite TV today and I previewed the channels and half or more could be removed especially the religious channels and sports channels ! I am looking forward to PBS and the Animal channels. I am still working on getting the telephone installed maybe next week then again who knows. I also went to the swap meet today which isn’t to far away from where I live. One of my neighbor’s sells jams and decorated gourds there every saturday. I walked around and noted who sells what and found some furniture makers selling their wares. I also found that some sell plants, trees, bushes and soil for the garden there. I received a gift of plants from the neighbors so now I have to get a pot and soil for the flowers, they are petunias and they look lovely at their house. So far things are going well here hopefully it will continue to do so. 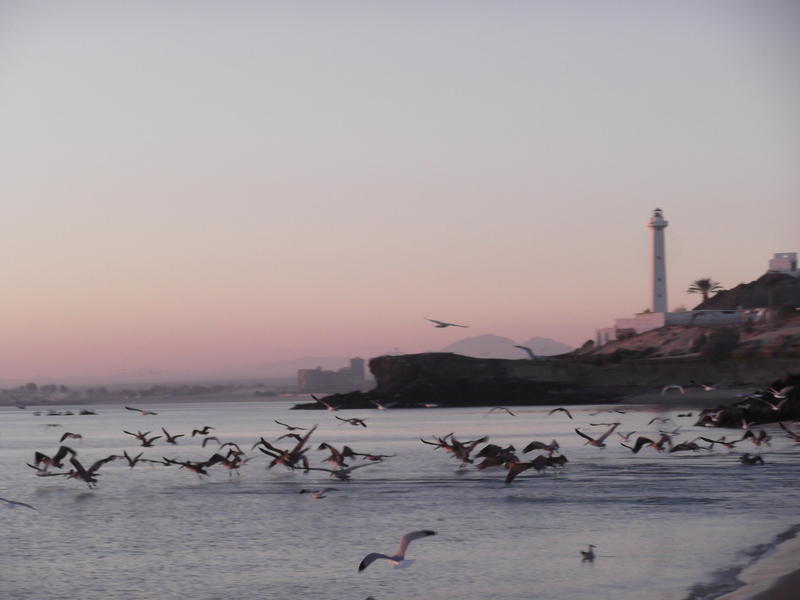 Nice sunny day here in San Felipe as are most days here. I took a walk with my dog Shelby on the beach and today we found some blue sea glass to add to my collection. I finally got my act together and moved to my new RV pad today. I had to tare myself away from the RV park as I was very comfortable there and the social atmosphere was very nice. I just felt it was time to move. I got help from fellow RV’rs to move my car while I drove my rig to Pete‘s Camp. Last thursday the telephone company came out to my lot and after the man checked where he had to pull the wires from to my lot declared (I think ) that the distance was to far and he had to talk to someone about it and for me to check with the telephone office later. So the telephone and internet is on hold till they figure out how to get the phone line connected. So far, everything works at the RV pad no problems. The builder Mr. Pacheco and I have had several discussions in broken spanish and english about the casita I want built. From the neighbors they think he is a good person to do the work and they don’t have any complaints about him. Still not having a fluent ability in spanish I am concerned that we are talking about the same things that I want done and that the price is fair. I guess I’ll find out just how good he is when I give him some money. The work he has done so far is good and the people I told about the price thought it was a good price. I am at the Camp restaurant using the local WiFi which seems to work better than at the RV camp I was living at before. Which is less frustrating than losing connection every few minutes. Hopefully this connection will stay strong and I will be able to use Skype better. Today I thought I might get something accomplished; I went to the telephone company to ask for service so I could get internet and was told I need two recommendations from my neighbors and I needed an electric bill or a copy of my contract for electric at my address. I went to the electric company and they said I needed the meter number. I then went to Pete’s camp and got the meter number and even took a photo of the meter. Then I found two neighbors who wrote notes of recommendation, then I went to the office and got a letter that said I was living there. By then it was time to go to the DMV and meet my mechanic to take the test and get my license and change the vehicle registration over to my name. The mechanic was late, very late and the man behind the service window came out and had me sit at his window while he started inputing information for my license in the computer. He had just about finished doing that and I had just handed over the money for the license when my mechanic showed up just in time to help me take the test on the computer. He helped me with the test-we passed the test and he left. I got to take a road test and I passed that then I had to pay for the new plates for the car and it was expensive. I also received my new provisional license and the photo wasn’t even bad. I went back to the electric company with my information on the meter number and they were closed so that was all I got done today. Tomorrow I will try and get the telephone business taken care of, change the car insurance into my name and find the TV dish company and see what they need for me to get TV reception at my new RV site. So tomorrow may be amusing as well. I celebrated tonight with dinner out and had Chiles Rellenos at a local restaurant they were excellent. So ends my day; the wind picked up from the east this evening cooling things off, I had to wear a jacket to go to dinner tonight. This is a poor photo of my new tattoo the shine is caused by the cream I am putting on it to help it cure/heal. So for all that are interested here it is. Today started out cloudy and stayed clouding and we have gotten several sprinkles/showers that didn’t accumulate much until this evening and now we are having a real shower. I went did my laundry at a laundry-mat near where my RV pad is, it is a modern place nice machines and the price is reasonable $1.50 a machine to wash and dry. They also will do your laundry for you, wash and fold, for $5.00 a load. If it had a TV the place would be perfect as it is there is a deli within walking distance and they have a TV so I went there for a coffee and had a chat with the owner for a few minutes while my clothes were washing. I live such an exciting life eh ? I was in town checking on the mail. I have been chasing a couple of packages that I know where here and found them , YEA, they were in a friend’s car as we share the same mail box and he picked them up and was looking for me, but I didn’t know he had already picked up the mail. 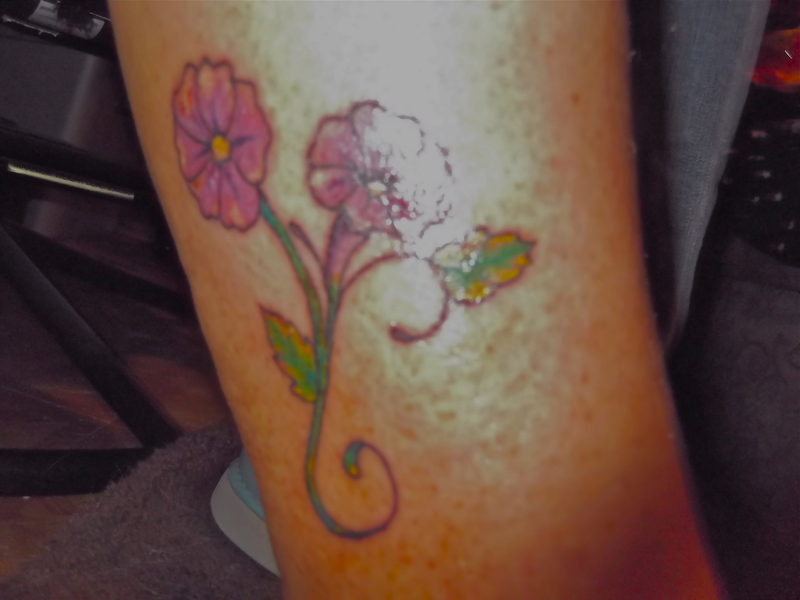 While I was in town I stopped by the place I got my pedicure the day before, it is a beauty salon and tattoo parlor in one sort of thing and they had a special on tattoos this month so I got some flowers tattooed on my lower right leg. After that I went and checked on my visa (FM-3/non-imigrant) and to my surprise it was ready, then I had to go to Mexican Immigration to actually have them make the visa card. Now I am legal for a year. I don’t have to leave and come back after six months and pay another fee and come back I can come and go when I want or need to until I renew next Nov/Dec. Also having the visa allows me to get my driver’s license and today I am supposed to meet with the lady I bought the car from to have her sign the bill of sale in spanish and get copies of her visa. Then it’s back to the DMV. I tried using skype last night, however the connection wouldn’t stay up so after five or six interuptions Samantha and I gave up on the call. I need a better connection so at the new place I am getting a land line put in so I have to go to the Mexican telephone company for that and that may turn into an adventure also. So I finally got to go to the DMV here in San Felipe this afternoon and not surprising there is a problem(s) 1. they wanted the bill of sale in spanish, 2) they want a copy of the seller’s FM-3, 3) they won’t let me take the test or take over the car until my FM-3 is in hand. An FM-3 is a non-imigrant visa. I have applied for mine but it hasn’t been granted and issued yet. So the car paper work is on hold until then. So we have to get the items from the seller and may get that done on saturday. I went out to the RV site/homesite today and we tested the water pump for function and leaks-it appears to work well. But the builder says he’ll check it in a few days for leaks as this can happen days later. I also went with him to look at other houses and of course the ones I like cost more money than I want to spend. We’ll discuss it more later maybe saturday. I don’t want to get too expensive on the other hand I want a cute little house. I finally got some photos up loaded; I had to get up at 5am to do it. Photo up loader is still not functioning the way I think it should. (sigh) I loaded four photos and got only one to post. Hmmm, I guess first things first; I awoke on saturday morning and as usual took my dog Shelby for a walk on the beach. It was very early in the morning the sun was just beginning to come up, I noticed two men standing over something that looked like a body. Oh,oh say me to myself what is this? As it got lighter I could see that it was an animal so I went closer to have a look and it turned out to be a dolphin. It had washed up on the shore durning the night. I felt sad and wondered how this came to be. Shelby and I went for our walk in the opposite direction away from the dolphin. I was surprised Shelby didn’t seem to have any interest in the dolphin. When we got back from our walk, I talked to the neighbors about it and they expressed their sadness at the loss of such a beautiful animal. I went back to my RV and I was about to start the car when I noticed I had a flat tire. Sheesh, I haven’t owned the car for more than a few hours and I have a flat! One of my fellow RV’rs here at the park lent me his little air compressor and I pumped up the tire and thought I would just drive up the hill and get it fixed. I had forgot how early it was and the tire repair store wasn’t open yet and wouldn’t be open for another hour. So I drove back to my RV and had coffee and toast. Later I took another neighbor and we drove to the tire repair shop and got the tire fixed for about $3.00 American and then we drove into town so my neighbor could have breakfast. After breakfast we drove out to my lot in Pete’s Camp to have a look at what work had been done. When we got to the lot at Pete’s Camp we found the workers hard at work and the trenches had been dug for the water, sewer and electric lines and they were working on getting the new soil tramped down for the gravel that was coming. The big water tank was there and someone had been working on the electric meter post. My neighbors came out and we had a chat with them about the work being done and they said how hard the workers were working yesterday. I suspect that the workers only put in a half a day’s work today. The builder boss showed up and we had a chat about what was going on and he seemed happy that things were going smoothly. My friend and I then went to the restaurant at Pete’s camp for some coffee. We had a nice conversation with the folks there and enjoyed some french fries as well. When we got out of the restaurant we noticed that there was a huge fog bank coming in off the water. I quickly got my dog out for a walk and as soon as she had done her business we loaded up and headed back to town and our RV park. I didn’t want to be driving the fog. By the time we got back to the RV park our fellow neighbors where being entertained by a Mexican band. I paid them their fee for a Mexican song I like and they started playing. I move up close to the singers and a young man that was singing started dancing with me! That was a hoot I enjoyed that a lot. I was sorry to se the band leave. Later that evening I went with my friend Ron out to eat. This little town is very active at night and there are lots of food stands and restaurants to choose from and my friend has his favorites. After dinner we came back to the RV park and had a few drinks with our neighbors and soon it was time to call it a night. I made some tea to go with cookies and heard the wind outside and felt the RV move, a wind storm had moved in and was blowing things around, the wind stayed up most of the night and in the morning we had over a dozen big fishing boats anchored off our little beach. 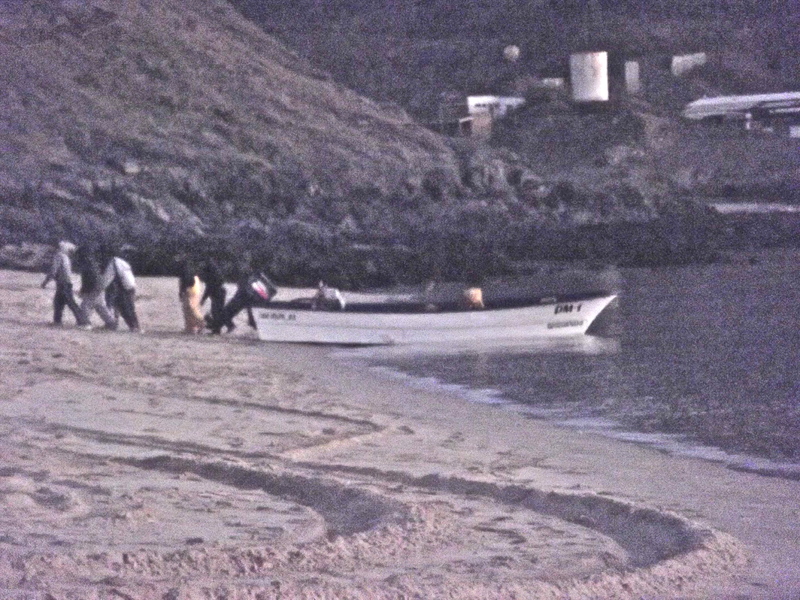 I guess they don’t like to fish when it is rough out on the Sea of Cortez. This morning (sunday) my friend and I went to town again for breakfast, I only had toast and coffee, as I already had made pancakes for breakfast. After breakfast I took Ron to a pharmacy so he could get his medications and then to the bank so he could get some cash out of the ATM. When we got back to the RV park we were invited to play Bocce with our fellow travelers and had a great time in a fun and friendly competition. I finally got back to my RV after bocce and in minutes the wind started up again so it might be a bumpy night hopefully no more dead animals on the beach monday morning. I don’t want to see that again soon. Thursday the builder Mr. Pacheco shows up and we go get the letter from the camp so we can take it to the Mexican electric company. We also go to the lot and measure and discuss what has to be done to make the lot ready for me to use with my RV. The we go to the electric company called by its letters here in Mexico, CFE. The tell us that he has to make the electric post ready for the meter and he has to take a photo of that and show them he has done the work. He tells me I don’t have to go with him again to CFE and they will include the price of installing the electric meter on my bill which will be eighty pesos ($6.50). Then we go look at a truck I heard about, more about that later. Thursday evening Mr. Pacheco(the builder) shows up at my rig and shows me some parts out of the electric meter post and tells me that they all have to be replaced. The good news is that they don’t cost all that much just that it has to be done and adds to the bill. These things are to be expected. The bill for building supplies is $1600.00 so far. He told me that his workers have already started on the lot trimming some small trees and leveling the lot. He told me that he will be out of town friday and won’t be back till monday, good to know.